A historical novel which reimagines the lives and intimate friendships of humanitarian and Irish patriot Roger Casement; his closest friend, Herbert Ward; and Ward’s extraordinary wife, the Argentinian-American heiress Sarita Sanford. ...a big, ambitious book guided by the same intelligence and sly prose that distinguished her portrait of [Mary] Kingsley ... Murray’s parsing of these escalating risks is superb. She has a knack for alluding to the era’s public events and concerns in a manner that lets us understand their impact and influence without her laboring over their details — an indispensable gift for a historical novelist ... [a] wise, illuminating novel. 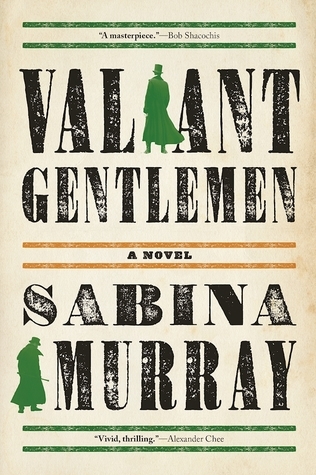 ...a novel as vigorous, audacious and unpredictable as Casement himself ... the dichotomy of valor and cowardice invests Murray’s narrative with shape and momentum ... although set a hundred years ago, [Valiant Gentlemen] denies the reader the consolation of centennial retrospection, and in so doing translates the past into a present as immediate as it is unnerving. ...learning about their mutual and divergent historical paths is one of the pleasures of Valiant Gentlemen ... That the novel can be so despairingly honest about a writer’s limitations while still be so entertaining says a lot about Murray’s considerable talent ... It as much a novel about the joys and difficulties of friendship as it is about the larger historical events that have thrown these two particular friends together and that also threaten to tear them apart. What did you think of Valiant Gentlemen?